Acousticel R10 is a recycled rubber resilient insulation designed to decouple concrete screed floors from concrete base floors and should be used to comply with Part E for efficient soundproofing of floors. Acousticel R10 is produced using black, recycled shredded vehicle tyres bonded to a tough carrier layer enabling it to be rolled into easy to carry 1m long rolls. When unrolled will cover 5m2. Standard MF ceiling system below. 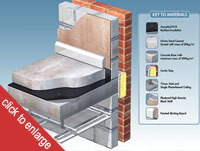 MF steel frame system that can have 100mm of acoustic mineral wool inserted if required for a better performance and with a single sheet of high density plasterboard screwed beneath. 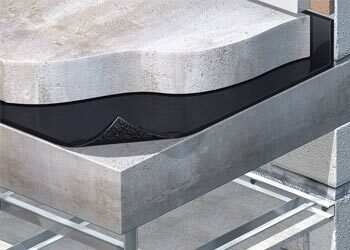 A 10mm thick resilient rubber, impact absorbing insulation designed to isolate concrete screeds of at least 65mm thick. Acousticel R10 can be used to decouple screeds from a wide variety of different concrete bases including beam and block and hollow beams as long as the overall mass per square metre is at least 365kg which is essential to control airborne noise in separating floors. 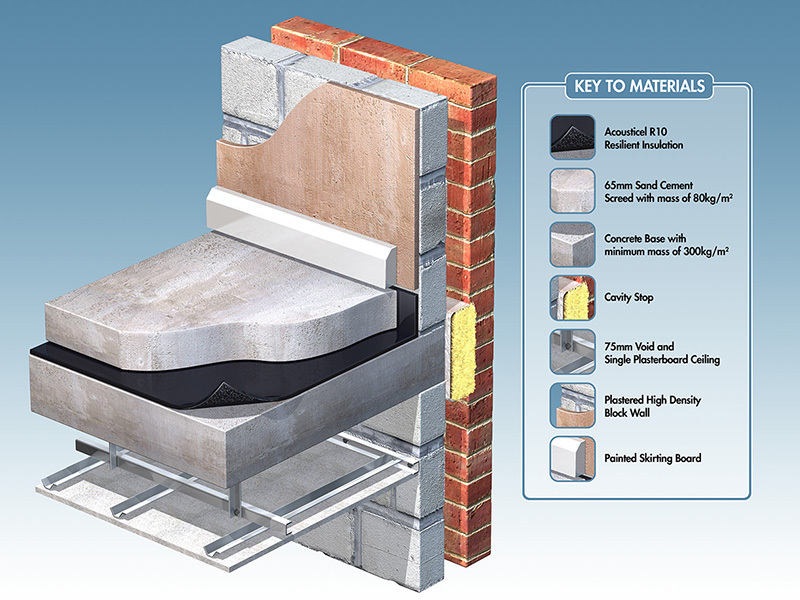 The product has been rigorously tested by independent companies and is proved to be an efficient solution when compliance with Part E of the Building Regulations is required for separating floors in flats.